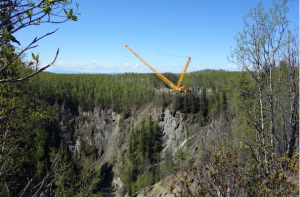 The Conservation Fund has nearly completed the demolition of the long-abandoned Lower Eklutna River dam, near the Native Village of Eklutna, Alaska. The Lower Eklutna River Dam Removal Project is the most ambitious river restoration project ever attempted in Alaska. In the United States there are roughly 26,000 dams that are considered to be at high risk of failure, and many of these are abandoned or “deadbeat” dams that no longer serve any useful purpose. The push to take down these obsolete dams has gained momentum as 1,275 dams have been dismantled in the past 30 years. According to the non-profit American Rivers, a record high number of 87 dams were removed in 2017. Some of the largest high-profile dam removals have been completed in recent years on the Elwha and White Salmon rivers in Washington and the Kennebec and Penobscot rivers in Maine. Four major dams slated for removal in the near future on Oregon’s Klamath River. Real progress has yet to be made in dismantling the motherlode of deadbeat dams found on the Snake River in Washington and Idaho. The Lower Eklutna River dam was built in 1928 as part of Alaska’s first hydroelectric project. Located in a dramatic 400-foot deep canyon, access to the dam site was a severe challenge during the construction (and demolition) of the dam. In construction, a tram cart delivered concrete down the cliff face to the workers below. This hardy crew worked throughout an entire Alaskan winter to complete the dam in a year’s time. The dam itself was a concrete arch whose dimensions were 70 feet wide, 100 feet tall and 9 feet thick at the dam base. This structure pooled and diverted water through a half-mile tunnel to a generating station nearby. Power ran by wire twenty miles south to Anchorage, providing the first reliable supply of electricity to this frontier settlement. The Lower Eklutna power project operated until the early 1950s when it was decommissioned and ultimately abandoned. Ownership of the dam remained in limbo until settlement of the Alaska Native Claims Settlement Act conveyed the dam and all the surrounding land to the Eklutna Village Native Corporation. The Eklutna River was once a prolific salmon-producing river that supported the Eklutna Dena’ina people, who located their village on Cook Inlet’s Knik Arm near the mouth of the Eklutna River. Although the Native Eklutna people are still there, the salmon are greatly diminished, due to a succession of water diversions and hydropower projects which cut off water flow and fish passage in the Eklutna River. 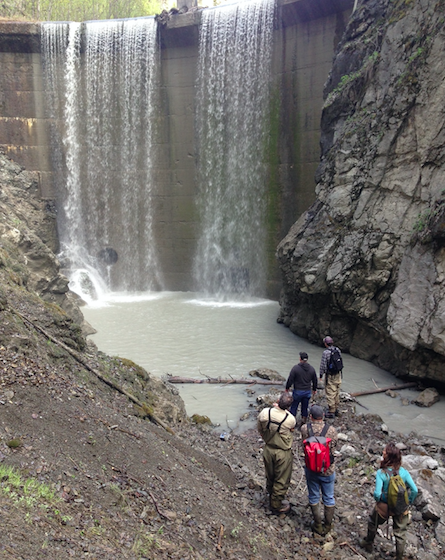 Repeated studies over several decades have recommended the removal of the Lower Eklutna River dam as an essential first step in restoring the Eklutna River. Despite being decommissioned in the 1950s, the Lower Eklutna Dam survived the 1964 Alaska Earthquake (magnitude 8.2) with no signs of impairment. Though the dam remained structurally sound and showed no imminent signs of failure, the State of Alaska Office of Dam Safety had long-recommended its orderly removal. Because the structure was an orphaned, unmaintained dam upstream of three bridges, a major highway and a railroad, there was significant public safety benefit to removing the dam in a controlled manner rather than waiting for its ultimate failure. Restore fish passage to a seven-mile reach of the Eklutna River. Improve spawning habitat in the lower Eklutna River for five species of salmon and Dolly Varden. Reestablish natural river functions in the lower Eklutna River. Reestablish habitat connectivity for fish and other wildlife on the lower Eklutna River. Take a major step toward the recovery of the entire Eklutna River watershed. Although removal had been discussed for decades, The Conservation Fund began to actively pursue the dam removal in 2014. After identifying key partners, in collaboration with Eklutna Inc. (the Eklutna Native village corporation and landowner) and HDR (primary technical consultants for the project), the Fund initiated project scoping, baseline research, and assessment of construction methodologies in 2015. With necessary permits secured in 2016, site preparation was completed in fall of 2016. The 2017 work season saw the removal of 90% of the dam structure, the remainder of which should be entirely removed this spring. Site remediation and negotiations for the restoration of in-stream flows and monitoring of spawning, turbidity and sediment transport will continue into 2020 and beyond. Funding for the $7.5 million project was provided largely by The Conservation Fund, with additional financial support from the Rasmuson Foundation, the M.J Murdock Charitable Trust, the National Fish and Wildlife Foundation, the Open Rivers Fund of the Hewlett Foundation, Resources Legacy Fund, the Marnell Corporation, the Alaska Sustainable Salmon Fund, Patagonia, Orvis, Wells Fargo and the Alaska Community Foundation. Where most major dam removals take decades to complete, this project has gone from concept to near-completion in only three years. The rapid advancement of the project is due in large part to the fact that most of the money came from private sources, short circuiting the lengthy delays that inevitably come with government funding. With a backlog of thousands of deadbeat dams that are slated for removal across the nation, this project serves as a model of efficiency and cost-effectiveness. In addition to the funding challenges, there were severe technical challenges to the project. The Lower Eklutna River dam is located in a 400-foot deep canyon with sheer walls and no road access. Accessing the dam involved the installation of the state’s largest crane with a 400-foot reach and construction of a dramatic 500-step aluminum staircase into the canyon. An additional complication was working on and around the 70-feet deep accumulation of 300,000 cubic yards of silt, sand, and gravel that had built up behind the dam following its abandonment in 1955. Combined with the tight confines of the canyon, these unstable and dynamic sediments required caution and creativity. Concerns for the downstream infrastructure ruled out blasting the dam. Instead, a combination of fracturing with expansive grout and hammering with pneumatic jackhammers was used to break the dam down into bite-sized chunks. Sediment management techniques included 10-foot by 20-foot polycarbonate “tundra mats” to keep the machinery out of the LaBrea-tar-like muck and a hydraulic mining monitor to move the sediment away from the work area. Removing the Lower Eklutna River dam has already provided significant economic benefits by creating over 30 jobs in construction, research and project management for Native Alaskans through the partnership with the Native Village of Eklutna and the Eklutna Native Corporation. Additional benefits to all Alaskans include the recovery of Cook Inlet King Salmon and the potential restoration of a major Sockeye Salmon run just 30 minutes from Anchorage. Restored salmon runs will also help the endangered Beluga Whale with additional forage fish sources. Although removal of the Lower Eklutna River dam will not by itself rebuild salmon runs to their historic levels, the mere presence of the dam has thwarted any other restoration efforts. The main limiting factor for salmon in the Eklutna River is very low water due to hydropower diversions. The Eklutna Power Project, a federal project further up the watershed from the Lower Eklutna dam, diverts 90 percent of the water out of the Eklutna watershed into a tunnel that services a powerhouse located on the Knik River. The power producers, a consortium of three utilities, have long argued that releasing water into the Eklutna River is pointless as long as the lower dam remains in place. Complete recovery of the Eklutna River will depend on the restoration of water flows back into the Eklutna River. The Eklutna Power Project is authorized under the 1991 Eklutna-Snettisham Agreement, which requires the Eklutna Power Project operators to initiate mitigation for their impacts to fish and other wildlife no later than 2022. The state and federal regulatory agencies that have jurisdiction over the Eklutna Power project have taken the view that sufficient water flows must be restored to the Eklutna River to mitigate for 88 years of water diversions. Taking all the water out of a salmon-bearing river is no longer an acceptable practice. Beyond the significant conservation benefits that will result from removing the Lower Eklutna River dam, this project has greater symbolism. One reason Alaska still has abundant salmon is because we have mostly avoided the mistake of building dams on salmon-bearing rivers. At the Eklutna River, Alaskans are recognizing the problems created by an ill-considered dam and are collaborating to fix those problems. We hope this project will be a constant reminder to Alaskans and other Americans that salmon and dams are generally incompatible. Brad Meiklejohn is Alaska State Director for The Conservation Fund, a national non-profit organization dedicated to the protection of America’s land and water, where he has worked since 1994. Brad has directed conservation projects protecting over 300,000 acres of wild land in Alaska, New Hampshire and Nevada. Brad is also the President of the American Packrafting Association, with over 2,000 members in 30 countries. Brad is a conservationist, birder and wilderness explorer and has completed packraft expeditions on 6 continents. Brad served as Associate Director for the Utah Avalanche Center during the 1980’s, and as President of the Patagonia Land Trust. Brad is a past board director of The Murie Center and the Alaska Avalanche School.